Excited to share the new audio and Kindle book covers for The Debutante Queen! 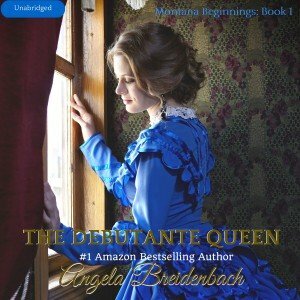 The Debutante Queen, 1st in the Montana Beginnings series is available as an audiobook. What’s The Debutante Queen about? 1. Leave a comment on this post about how you listen to audiobooks (like in the car, while working out, while cooking… whatever). 2. On Friday, I’ll pick the first winner. On Saturday, I’ll pick another winner, and on Sunday…well, you get the picture 😉 I’ll choose a winner each day for 5 days starting 11/27/15 as long as there are new comments on this post. Yes, I have comments protected for the first two times someone posts in order to protect both you and me from spammer/scammers. But I’ll be watching for comments and approve them as quickly as humanly possible. 3. Full disclosure: Yes, I would like reviews from those who listen. That’s how books sell. But all I ask is that you post an honest review in a timely manner and please review both the story and the performance so potential buyer/listeners know what you think so they can make a buying decision. The audiobook sells for $14.95. If you’re not an audiobook listener, but have always wondered about them then this is the contest opportunity for you 🙂 Winners will get an email with instructions on how to use the free code and how to use Audible for the 1st time, just in case. 4. So, make sure I have a way to contact you (you can use the contact page on this website if you’d like to keep your email secret–in fact, I’d suggest that for internet safety–or you can leave me a twitter or facebook handle where I can also contact you and I’m happy to let you share that with others to build your followings on those social media platforms. Why Twitter or Facebook? Those are the social media platforms I use the most and they’re the easiest for me to share with you and others. 5. Please share this contest with your friends so they can enter. That gives everyone more chances in the contest so there are new comments coming each day. Previous Article Previous Article: Lassoed by Marriage is on pre-order!